We’ve seen circular robot vacuums and D-shaped robot vacuums, but the Pure i9 is the first triangular one we’ve encountered. Electrolux has trademarked the design Trinity Shape, and it facilitates better cleaning of the corners, baseboards, and other edges in your home. 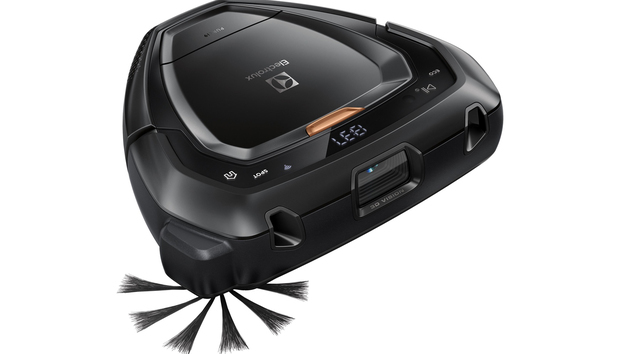 It also reduces the vacuum’s footprint: the Pure i9 measures just a hair over 12.5 inches in diameter, making it considerably slimmer than the recent iRobot Roomba, Neato Botvac, and Ecovacs Deebot models we’ve reviewed. An LCD display showing the time, battery level and Wi-Fi connectivity status are on the top panel. Beneath it is a 0.7-liter top-loading dustbin that pops up easily with the press of a bronze-colored release button. On the vacuum’s underside are an anti-tangle roller brush and a single spin brush. A pair of retractable wheels allows the Pure i9 to maneuver over changing indoor terrain. The Pure i9’s slim profile and unique shape enables it to get into corners and under furniture. The Pure i9 ships with only a charging dock. It’s connected and controlled with the Pure i9 companion app, so setup should be as simple as plugging in the dock, setting the vacuum on its charging contacts, and following the app prompts to connect the vacuum to your network. Emphasis on should: I encountered the same issue many other users have complained about in the Google Play store: the Android app crashes. A lot. 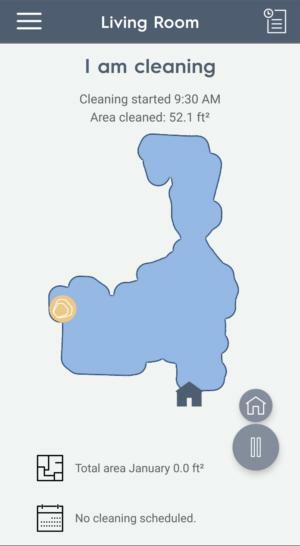 In more than a dozen attempts, the aborted repeatedly at various points in the setup process, providing only an “unknown error” message and an offer to “try again.” I eventually switched over to the iOS app, which connected flawlessly on the first try, and then logged into the Android app to operate the vacuum. The Pure i9 houses a 3D camera in its front bumper that allows it to navigate more precisely than robot vacuums that rely solely on sensory input. It works exceptionally well—the vacuum never once bumped into a chair leg, wall, or other obstacle, clearly recognizing these before impact and maneuvering around them. You can view the robot vacuum’s cleaning path in real time in the app. Instead of ping-ponging haphazardly around the room, the vacuum stakes out a section of floor and cleans in a back-and-forth pattern until that patch is done, it then advances to another section and so on until the whole job is complete. Often it will pause to assess an obstacle or some other feature of the area it’s cleaning. Occasionally these pauses dragged on to the point I thought the vacuum had gotten hung up on a stray toy or something, but then it would spring back into action just as I was going to inspect it. When the Pure i9 really does get into trouble, it lets you know with a voice message and an in-app alert. These didn’t always accurately identify the problem, though. At one point, for example, the vacuum said its left wheel was stuck. When I flipped it over, I found that the wheel wasn’t stuck at all, but that a rubber band had gotten entangled in the roller brush. Still, once I removed it and set the vacuum upright again, it continued its cleaning without a hitch. The vacuum automatically detects the type of floor surface it’s on and adjusts its suction power accordingly. That was perfect for my downstairs area, which includes low-pile carpet, hardwood, and linoleum in various rooms. The Pure i9 maneuvered these seamlessly and left them clear of pet hair, food crumbs, and tracked-in dirt. In addition to on-demand cleaning, the Pure i9 also includes a scheduling option. 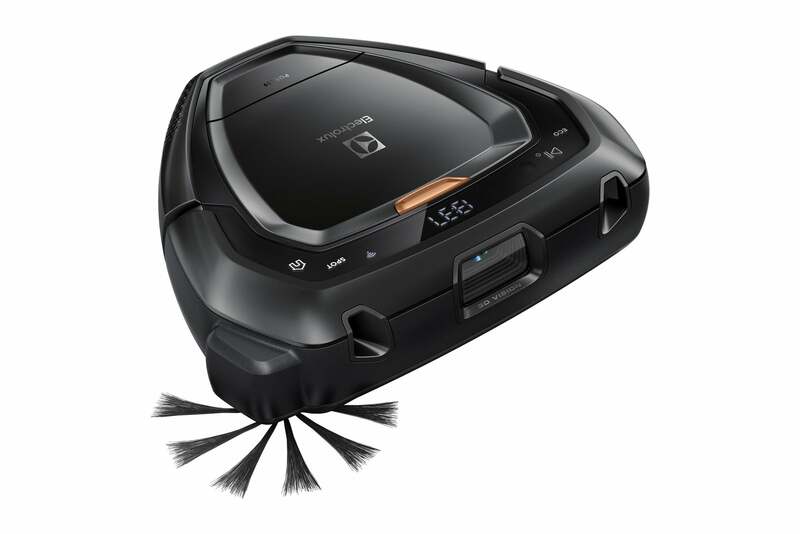 Unlike a lot of robot vacuums that require you to schedule cleanings for the same time every day, the i9 can be assigned a different cleaning time for each day of the week. 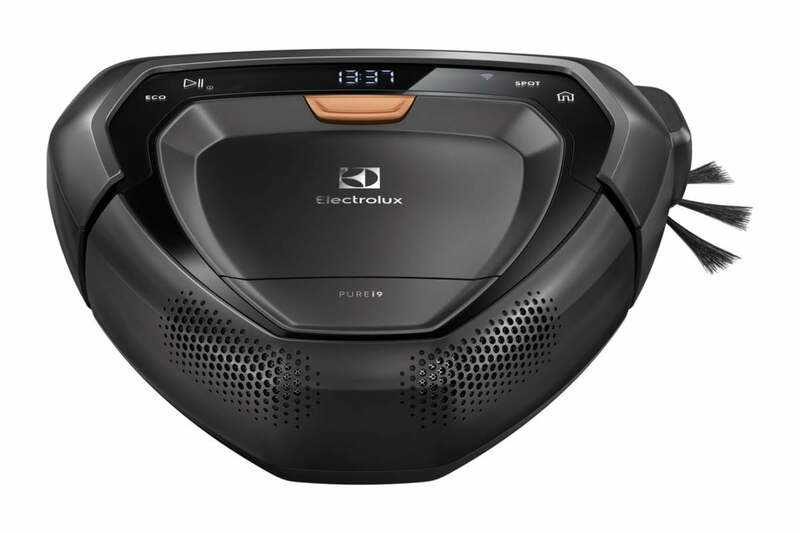 Electrolux claims a 40-minute battery life in Normal mode and 60 minutes in Eco, but I found the vacuum to run slightly longer in each. If the vacuum does run low in the middle of a job, it will return to its dock to top off the battery and then resume cleaning. The companion app alerts you if the Pure i9 encounters trouble. Though it was unusable for setting up the Pure i9, the Android app worked fine as a remote control. You can activate, pause, and end cleanings from its home screen, and also watch its progress as it cleans. 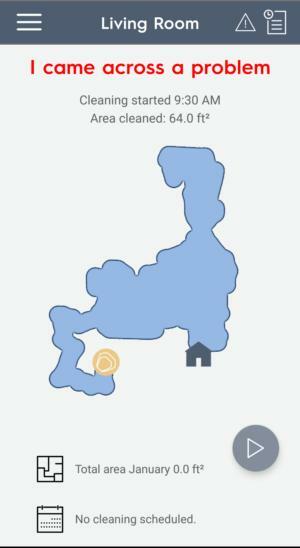 The area maps it displays aren’t terribly detailed, but they reasonably resemble the shape of the room once they’re complete. The app also shows the total square footage of the area cleaned. A three-bar menu at the top left provides access to a few customization settings—Eco mode and a “mute” function that quiets the vacuums decibel level a bit—a user guide and tutorial videos, and online support. At the upper right is a History menu that displays cleaning square footage and duration in total and by month. The Electrolux Pure i9 is a diligent cleaner with excellent navigational skills. Even with the vacuum selling on Amazon for $684 at press time—$215 less than its $899 MSRP—it’s still lacking compared to similarly priced robot vacuums. The Ecovacs Deebot OZMO 930, for example, offers app control plus multiple floor maps, the ability to set virtual boundaries, and a wet-mop option for hard floors. For just $399, the Netatmo D4 Connected includes floor maps with virtual boundaries and smart-home integration with Google Home, Amazon Alexa, and IFTTT. Even our favorite budget model, the Ecovacs Deebot N79S, includes Alexa-enable voice control. While there’s something to be said for the Pure i9’s simplicity, you’ll get more value for your spend with any one of those products.